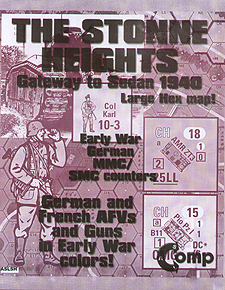 Welcome to STONNE HEIGHTS - THE BATTLE OF FRANCE 1940, the update of the historical module originally published as Stonne 1940/Grossdeutschland at Stonne. The enclosed campaign game and interrelated scenarios allow two or more players the opportunity to recreate the battle fought for the commanding heights at the village of Stonne in the Sedan sector during the German breakthrough at the Meuse in May 1940. The game uses the Platoon Leader 2.5 system to provide a series of interrelated scenarios, or 'firefights' which simulate the ongoing nature of the battle.